Shudder’s Newest Guest Curator Collection: Press Release: New York, New York- March 17, 2015 - Shudder, the diabolical horror streaming service backed by AMC Networks, continues to expand their offerings for horror fans. As part of Shudder’s guest curator initiative, director Alexandre Aja (High Tension, The Hills Have Eyes , Piranha 3D) has created a collection of his top five horror films, now live on the Shudder platform. Aja’s collection will be the second as part of Shudder?1;s guest curator program, which kicked off last month with a collection by director/writer Robert Eggers (The Witch). Each guest curator carefully selects their top five horror films based on personal taste and impact on the genre. 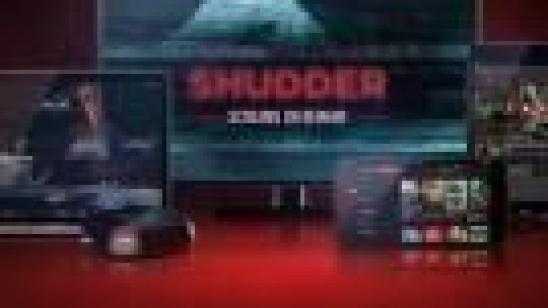 Shudder plans to continue the program on a monthly basis with collections from new guest curators. Growing up on Akira, Tetsuo was- for me- the perfect development of man?1;s evolution into machine, or how the industrial world we are living in might ultimately consume us. This Cronenbergian hallucination is graphic, fetishist, expressionist, and a beautiful black and white journey. Somehow- it?1;s like the Japanese Eraserhead. Definitely cult! It’s been a long time since I had to stop watching a movie because it was too intense! The imagery is so haunting, every frame of that forest is a cinematic painting. The darkness of love stories and human relationships challenge the audience by taking them in the most remote and dark places of our own nature. The film is a provocative experience like a question mark burnt on your skin. Extreme, conspiratorial, funny- most of the crazy theories might be just pure fiction in this ode documentary, but it?1;s so exciting to milk the fantasy of the almighty Stanley around the making of The Shining. The idealistic vision of the ultimate filmmaker?1;s ability to layer subtext, hidden messages in every frame of one the best movies ever made! The most honest attempt of depicting serial killers. No artifice. Nothing about the deaths themselves. No fear or suspense. Just the casual build up and the cold aftermath. An immersion into the inconceivable mind of killers and the performance by Michael Rooker is unforgettable. Alexandre Aja is a French film director who made his directorial debut at the age of eighteen with the short film Over the Rainbow, which received a Cannes Film Festival Golden Palm Award nomination for best short film. Aja is best known for his work on High Tension (2003), Hills Have Eyes (2006), and Mirrors(2008). In 2004, he was listed as one of Variety’s Ten Directors to Watch. He is currently working on The Sentinel and The 9th Life of Louis Drax which starsJamie Doran (Fifty Shades of Grey, The Fall), Sarah Gadon (Dracula Untold), and Aaron Paul (Breaking Bad, Need for Speed). Synopsis: In Tokyo, Shigeharu Aoyama is a widower that grieves the loss of his wife and raises his son Shigehiko Aoyama alone. Seven years later, the teenage Shigehiko asks why his middle-aged father does not remarry and Shigeharu meets his friend Yasuhisa Yoshikawa, who is a film producer, and tells his intention. However, Shigeharu has difficulties to approach to available women to date and Yasuhisa decide to organize a sham audition for casting the lead actress for the fake movie. They receive several portfolios of candidates and Shigeharu becomes obsessed by the gorgeous Asami Yamazaki. Despite the advice of the experienced Yasuhisa, Shigeharu calls Asami to date and he falls for her. But who is the mysterious Asami? Synopsis: A strange man known only as the "metal fetishist", who seems to have an insane compulsion to stick scrap metal into his body, is hit and possibly killed by a Japanese "salaryman", out for a drive with his girlfriend. The salaryman then notices that he is being slowly overtaken by some kind of disease that is turning his body into scrap metal, and that his nemesis is not in fact dead but is somehow masterminding and guiding his rage and frustration-fueled transformation. Synopsis: A subjective documentary that explores the numerous theories about the hidden meanings within Stanley Kubrick's film The Shining (1980). The film may be over 30 years old but it continues to inspire debate, speculation, and mystery. Five very different points of view are illuminated through voice over, film clips, animation and dramatic reenactments. Together they'll draw the audience into a new maze, one with endless detours and dead ends, many ways in, but no way out. Synopsis: Loosely based on serial killer Henry Lee Lucas, the film follows Henry and his roommate Otis who Henry introduces to murdering randomly selected people. The killing spree depicted in the film starts after Otis' sister Becky comes to stay with them. The people they kill are strangers and in one particularly gruesome attack, kill all three members of a family during a home invasion. Henry lacks compassion in everything he does and isn't the kind to leave behind witnesses - of any kind.